Recently I've been off my candles a little and been favouring wax melts instead. 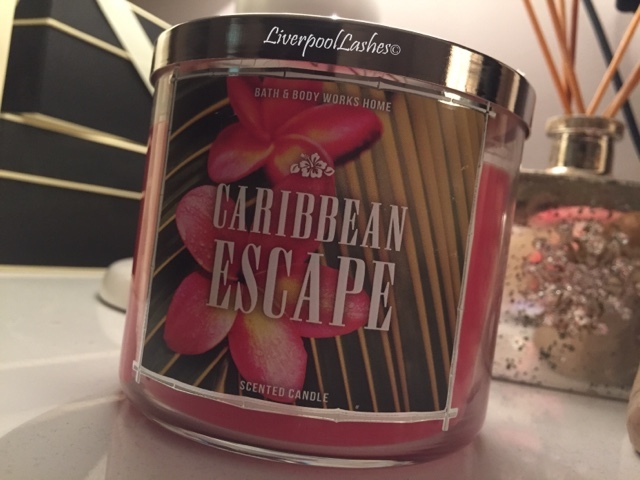 I do realise that I have a huge stash of Bath & Body Works 3 Wicks though so I pulled out Caribbean Escape to burn. This candle says that is has a blend of tropical melon, raspberry nectar and lemon mellowed by creamy coconut mik which is pretty accurate to what I'm smelling. I would say the scent throw is fairly strong, up there with their most fragrant candles. My only "con" with this candle is the fact that the wicks seemed to be pretty short. For that reason it seemed to struggle to burn evenly. It even has gotten to the point where as the wicks blow out for no reason as well which is annoying. That aside it is a fantastic candle and I highly recommend it for the summer!